In the setting of rotator cuff injuries, higher degrees of fatty infiltration into cuff muscles are positively correlated with higher repair failure rates and worse clinical outcomes. MRI continues to be the gold standard imaging modality for evaluating fatty infiltration of the rotator cuff, but ultrasound represents another viable modality for that assessment—at considerably lower cost. Such is the conclusion of Tenbrunsel et al. in a recent issue of JBJS Reviews. The authors reviewed 32 studies that investigated imaging modalities used to assess fatty infiltration and fatty atrophy. They found that grading fatty infiltration using ultrasound correlated well with grading using MRI. However, the authors identified difficulties distinguishing severe from moderate fatty infiltration on ultrasound, but they added that discerning mild from moderate fatty infiltration is more important clinically. Tenbrunsel et al. also mention sonoelastography, which measures tissue elasticity and can also be used to help determine the severity of fatty atrophy of the rotator cuff. Overall, the trade-off between MRI and ultrasound comes down to higher precision with the former and lower cost with the latter. For more information about JBJS Reviews, watch this video featuring JBJS Editor-in-Chief Dr. Marc Swiontkowski. In this Clinical Commentary based on the authors’ experience with >350 cases, Wilk et al. describe the rehabilitation process used for patients following UCL repair with an “internal brace.” This recent surgical advance in managing incomplete UCL tears enhances elbow joint stability while the ligament is healing. Despite what seems like a new, high-quality study being published on the topic every week or so, orthopaedic surgeons still have an extremely hard time determining whether a prosthetic hip or knee is infected or not. We have an array of available tests and the relatively easy-to-follow criteria for a periprosthetic joint infection (PJI) from the Musculoskeletal Infection Society (MSIS), but a large number of these patients still fall into the gray zone of “possibly infected.” This predicament is especially thorny in patients who received antibiotics just prior to the diagnostic workup, which interferes with the accuracy of many tests for PJI. In the April 17, 2019 issue of The Journal, Shahi et al. remind orthopaedic surgeons about a valuable tool that can be used in this scenario. Their retrospective study looked at 121 patients who had undergone revision hip or knee arthroplasty due to an MSIS criteria-confirmed periprosthetic infection. Shahi et al. sought to determine which diagnostic tests were least affected by prior antibiotic administration. The authors found that erythrocyte sedimentation rate (ESR), C-reactive protein (CRP) level, synovial white blood cell (WBC) count, and polymorphonuclear neutrophil (PMN) percentage were all significantly lower in the 32% of patients who had received antibiotics within 2 weeks of those tests, compared with the 68% who did not receive antibiotics. The only test that was found not to be significantly affected by the prior admission of antibiotics was the urine-based leukocyte esterase strip test. Considering the ease and rapidity with which a leukocyte esterase test can be performed and evaluated (at a patient’s bedside, with immediate results), its low cost, and the fact that it is included in the MSIS criteria, these findings are very important and useful. While we would prefer that patients with a possibly infected total hip or knee not receive antibiotics prior to their diagnostic workup, previous antibiotic exposure remains a relatively common scenario. The findings from this study can assist us in those difficult cases, and they add further evidence to support the value and reliability of the easy-to-perform leukocyte esterase test. Every month, JBJS publishes a review of the most pertinent and impactful studies published in the orthopaedic literature during the previous year in 13 subspecialties. Click here for a collection of all OrthoBuzz Specialty Update summaries. This month, Albert Gee, MD, a co-author of the April 17, 2019 “What’s New in Sports Medicine,” selected the five most clinically compelling findings from among the 30 noteworthy studies summarized in the article. –Norwegian researchers randomized 120 patients to undergo either single-bundle or double-bundle ACL reconstruction and followed them for 2 years.1 They found no difference between the 2 techniques in any patient-reported outcome, knee laxity measurements, or activity levels. These results, along with the preponderance of evidence from other comparative trials over the last 5 years, strongly suggest that routine use of 2 bundles to primarily reconstruct a torn ACL adds no clinical benefit over a well-positioned single-bundle reconstruction. –A randomized study compared long-term patient outcomes after knee cartilage repair using microfracture versus mosaicplasty.2 Included patients had 1 or 2 focal femoral lesions measuring between 2 and 6 cm2. Better outcomes after a minimum of 15 years of follow-up were found in the mosaicplasty group. Although there were only 20 patients in each arm, the Lysholm-score differences between the groups were both clinically important and statistically significant. More patients in the mosaicplasty group than in the microfracture group said they would have the surgery again, knowing their 15-year outcome. –UK researchers randomized 313 patients with ≥3 months of subacromial pain and an intact rotator cuff who had completed a nonoperative program of physical therapy and injection to 1 of 3 groups: arthroscopic subacromial decompression, diagnostic arthroscopy (“sham” surgery), or no intervention.3 At 6 months and 1 year, all groups demonstrated statistically significant and clinically important improvement, but patient-reported outcome scores were significantly better in both surgical groups compared with the no-treatment group. The data suggest that patients such as these improve over time, regardless of management, but that surgical decompression may offer a slight benefit over nonoperative management because of the placebo effect. –A randomized controlled trial investigated the effect of a formal preoperative education program (2-minute video plus handout)4 about postoperative narcotic use, side effects, dependence risk, and addiction potential among >130 patients undergoing arthroscopic rotator cuff repair surgery. The education group consumed 33% less narcotic medication at 6 weeks and 42% less at 12 weeks compared with the control group. Among the more than one-quarter of the patients who had used opioids prior to surgery, those randomized to the education group were 6.8 times more likely than controls to discontinue narcotic use during the study period. –A randomized controlled trial of >300 patients compared hip arthroscopy and “best conservative care” for treating femoroacetabular impingement (FAI).5 Only 8% of patients crossed over from conservative care to the surgical group. The mean adjusted difference in iHOT-33 scores at 1 year was 6.8, in favor of hip arthroscopy. However, adverse events were more frequent in the arthroscopy cohort, and a within-trial economic evaluation suggested that hip arthroscopy was not cost-effective compared with conservative care during the 1-year trial period. Aga C, Risberg MA, Fagerland MW, Johansen S, Trøan I, Heir S, Engebretsen L. No difference in the KOOS Quality of Life Subscore between anatomic double-bundle and anatomic single-bundle anterior cruciate ligament reconstruction of the knee: a prospective randomized controlled trial with 2 years’ follow-up. Am J Sports Med.2018 Aug;46(10):2341-54. Epub 2018 Jul 18. Solheim E, Hegna J, Strand T, Harlem T, Inderhaug E. Randomized study of long-term (15-17 years) outcome after microfracture versus mosaicplasty in knee articular cartilage defects. Am J Sports Med.2018 Mar;46(4):826-31. Epub 2017 Dec 18. Beard DJ, Rees JL, Cook JA, Rombach I, Cooper C, Merritt N, Shirkey BA, Donovan JL, Gwilym S, Savulescu J,Moser J, Gray A, Jepson M, Tracey I, Judge A, Wartolowska K, Carr AJ; CSAW Study Group. Arthroscopic subacromial decompression for subacromial shoulder pain (CSAW): a multicentre, pragmatic, parallel group, placebo-controlled, three-group, randomised surgical trial. Lancet. 2018 Jan 27;391(10118):329-38. Epub 2017 Nov 20. Syed UAM, Aleem AW, Wowkanech C, Weekes D, Freedman M, Tjoumakaris F, Abboud JA, Austin LS. Neer Award 2018: the effect of preoperative education on opioid consumption in patients undergoing arthroscopic rotator cuff repair: a prospective, randomized clinical trial. J Shoulder Elbow Surg.2018 Jun;27(6):962-7. Epub 2018 Mar 26. Griffin DR, Dickenson EJ, Wall PDH, Achana F, Donovan JL, Griffin J, Hobson R, Hutchinson CE, Jepson M,Parsons NR, Petrou S, Realpe A, Smith J, Foster NE; FASHIoN Study Group. Hip arthroscopy versus best conservative care for the treatment of femoroacetabular impingement syndrome (UK FASHIoN): a multicentre randomised controlled trial. Lancet. 2018 Jun 2;391(10136):2225-35. Epub 2018 Jun 1. The practice of using a geriatrician- or a hospitalist-based co-management team to care for elderly patients who are admitted to the hospital for treatment of fragility fractures or other orthopaedic procedures is now more than a decade old. These services have grown in popularity because patients are living longer with comorbidities and becoming more complex to manage medically, and because shift-based hospitalist practices have become more common. These coordinated partnerships help the hospitalist- or geriatrician-led medical team optimize the patient’s care medically, while allowing the orthopaedic surgeon to focus on the patient’s musculoskeletal condition. The consensus I have heard is that patients are better off with these co-management systems, but hard evidence has been sparse. In the April 17, 2019 issue of The Journal, Blood et al. report on the use of the Institute for Healthcare Improvement (IHI) Global Trigger Tool to assess the adverse-event impact of a Geriatric Hip Fracture Program (GHFP). 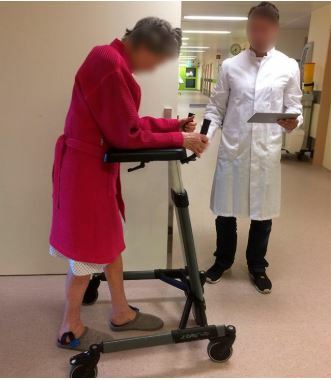 In a bivariate analysis of pre- and post-GHFP data, the authors document a decrease in the rate of adverse events and shorter lengths of stay among elderly hip-fracture patients after GHFP implementation. However, multivariable analysis confirmed only a trend toward decreasing adverse-event rates after the implementation of the program. This study also seems to confirm what many of us already know empirically—that hip-fracture patients with severe medical comorbidities (i.e., a high Charlson Comorbidity Index) are at increased risk of adverse events no matter what system of care they receive. Still, what most orthopaedic surgeons have felt was a “no-brainer,” coordinated approach to optimizing patient care and decreasing adverse events now has more evidence of effectiveness. Because such programs decrease both adverse events and length of stay among elderly patients hospitalized for a hip fracture, orthopaedic surgeons everywhere should advocate for increased geriatrician training to support this movement. Furthermore, these findings should encourage further research into additional patient-centric medical care strategies that could improve outcomes for these patients. Brainlab AG is recalling its Spine & Trauma 3D Navigation software (version 1.0). The FDA has identified this as a Class I recall, the agency’s most serious category. This navigation system provides images that help surgeons safely navigate instruments and implants used before and during minimally invasive surgeries. The software has been recalled because the displayed images may result in user misinterpretation and may prevent surgeons from accurately navigating surgical tools inside the patient. We hear the term “microbiome” with increasing frequency nowadays. Merriam-Webster’s online dictionary defines it as “a community of microorganisms (such as bacteria, fungi, and viruses) that inhabit a particular environment and especially the collection of microorganisms living in or on the human body.” Two recent studies suggest how the microbiome can affect musculoskeletal health. Incorporating the term “the arthritis of obesity,” Rochester, New York researchers1 used obese mice with trauma-induced knee osteoarthritis (OA) to provide evidence that there is a “gut-joint connection” in the OA degenerative process. After supplementing the diets of some of the mice with oligofructose (a prebiotic fiber), the authors found reduced systemic inflammation, reduced obesity-associated macrophage migration to the synovium, and suppressed obesity-induced joint-structure changes. Twenty-three DFU patients undergoing FST had wound samples collected at 0, 4, and 8 weeks following wound debridement and antibiotic treatment. Eleven ulcers healed and 12 did not. Healed DFUs had a larger abundance Actinomycetales and Staphylococcaceae (p < 0.05), while nonhealed ulcers had a higher abundance of Bacteroidales and Streptococcaceae (p < 0.05). In the future, assessment of the initial microbiome and monitoring changes in the prevalence of specific microbiome constituents in patients with diabetic foot ulcers may be a clinical tool for predicting treatment response to foot salvage therapy. It’s also conceivable that microbiome analysis could eventually help patients and surgeons decide between FST and amputation. Sometimes, patients with painful knee osteoarthritis do not get sufficient pain relief with conservative treatments and do not want (or are not suitable candidates for) arthroplasty. Now, with the advent of genicular nerve radiofrequency ablation (GNRFA), such patients have another option. As described in a recent issue of JBJS Essential Surgical Techniques, GNRFA has been shown to provide consistent pain relief for 3 to 6 months. Using heat generated from electricity delivered via fluoroscopically guided needle electrodes, the procedure denatures the proteins in the 3 genicular nerves responsible for transmitting knee pain. Although there is a paucity of high-quality studies on the efficacy of this procedure, one study found that, on average, GNRFA led to improvement of >60% from baseline knee pain for at least 6 months. General anesthesia is not required for the procedure, which is commonly performed by interventional pain specialists. Despite theoretical concerns, no Charcot-type joints have been reported after GNRFA. The authors emphasize, however, that the procedure provides temporary relief at best; it does not eliminate the potential for nerve regrowth and does not alter the arthritic disease process. Even more importantly, GNRFA needs to be studied with higher-level clinical research designs, ideally an adequately powered sham/placebo-controlled randomized trial. For more information about JBJS Essential Surgical Techniques, watch this video featuring JBJS Editor-in-Chief Dr. Marc Swiontkowski. The indications for treating total hip arthroplasty (THA) dislocations by cementing a constrained polyethylene liner into a well-fixed, retained acetabular component at the time of revision are narrow. That’s largely due to concerns about the durability of the resulting acetabular construct. Now, thanks to a study by Brown et al. in the April 3, 2019 issue of JBJS, hip surgeons have some hard data about the long-term outcomes of this approach. Survivorship free from revision for instability was 86% at 5 years and 81% at 10 years. The cumulative incidence of instability at 7 years was 18%. Survivorship free from aseptic acetabular component revision was 78% at 5 years and 65% at 10 years. The most common failure mechanism was dissociation of the constrained liner from the retained component. Harris hip scores (HHS) did not improve significantly after revision. This finding is consistent with prior research that shows better post-revision HHS scores in patients whose revisions include the entire acetabular component. Position of the retained cup did not affect implant survivorship or risk of dislocation.